Paella is the cornerstone of Spanish food. This version marries chicken with artichokes and the deep, sweet smokiness of old oloroso sherry. Start by browning 350g of boned and skinned chicken, cut into 2cm chunks in olive oil over a moderate heat in a wide frying pan or paella pan. The chicken doesn’t need to be cooked right through, just well browned. Chicken thigh meat is superior in flavour to breast, and should be used in preference, but breast will do, at a pinch. When the chicken is done, remove it and set aside. Turn the heat down to low, add a glug or two more of olive oil and gently fry two large onions, finely chopped, for at least twenty minutes until they start to caramelise and sweeten. Scrape the bottom of the pan with a wooden spoon as you go to lift any delicious burnt on chicken bits up into the onions. This is the paella’s extra body, so be sure not to waste it. Now the artichokes. You’ll need three large globe artichokes. Peel and trim the tough stalks, then pull away the outer leaves until the uncovered leaves seem to be more yellow than green. This is the tender heart of the artichoke. Use a small knife to tidy up the base of the head, cutting away any remaining tough parts, then slice the globe lengthways into eight pieces. Keeping the cut artichokes in a bowl of water with a big squeeze of lemon added helps to stop them discolouring. Prepping artichokes is a lot of work and there’s a fair amount of waste, but they’re worth it. Add the artichoke wedges, along with six finely chopped cloves of garlic to the onions and continue to cook for another ten minutes before adding 250g of paella rice. Turn the heat up and add 150ml of medium to dry oloroso sherry, and let the alcohol bubble away for a minute or two, then top up with 800ml of good chicken stock. Grate in some nutmeg, four strokes should be enough, season well, add a good handful of chopped flat leaved parsley, stir once and leave alone to cook over a low heat. 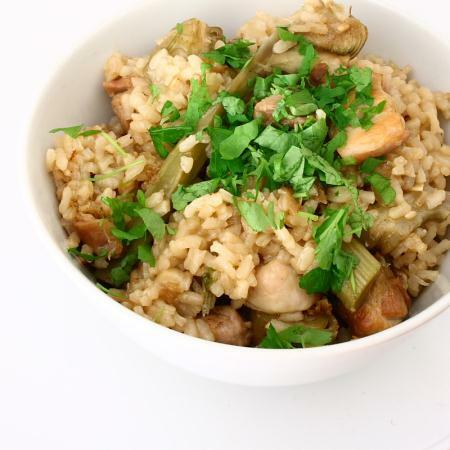 After ten minutes, add the chicken in an even layer and gently push it down into the rice and stock. Cook for five more minutes, then cover tightly with foil or a snug fitting lid and leave for another five minutes. Serve with wedges of lemon and more chopped parsley. This paella is from Sam and Sam Clark’s excellent Moro cookbook. Mmmmmm… burnt on chicken bits 🙂 looks delish! Yum! I am all about artichokes right now so I love the idea of them in paella. Conor – burnt on chicken bits are the food of the Gods. No arguing please. I'm too busy trying to find some burnt on chicken bits to argue..
MMMM….I've been craving artichokes lately. This sounds delish! That's a very pretty picture! It looks delicious. Paella is one of my favorite foods, I'm usually making a Swedish version with seafood from the Baltic sea and lots of dill. Mm. Look wonderful! I recently made my first paella for my wife's birthday.